Every summer we vary our cruises by sailing in two different areas of Greece, the Aegean Islands (Saronic and Cyclades) on the eastern side of the Greek mainland and the Ionian Islands on the western side. The journey from the east to the west and vice-versa which is organized as a one week cruise, will take you through some very interesting places and give you the opportunity to have a glimpse of both island groups. Our Greek Island cruises vary from year to year, so below you can check our cruising plan for 2019 (click on the cruising area to read more about the islands groups). You can also check for availability by clicking on Velos Availability or Alexandros Availability at the left menu on this page. Our Greek Island cruises vary from year to year, so below you can check our cruising plan for 2017 (click on the cruising area to read more about the islands groups). You can also check for availability by clicking on Velos Availability or Alexandros Availability at the left menu on this page. Our Greek Island cruises vary from year to year, so below you can check our cruising plan for 2016 (click on the cruising area to read more about the islands groups). You can also check for availability by clicking on Velos Availability or Alexandros Availability at the left menu on this page. The Cyclades in the Aegean (the islands with the well-known whitewashed houses) and the Dodecanese (Rhodes, Symi, etc.) are two very popular areas, but because of their distance from the mainland it's not possible to visit them in a one week cruise. After the success these cruises had in 2014, we planned five cruises for 2015, starting in Athens on the 3rd of May, sailing through the Cyclades, the Dodecanese, back through the Cyclades, finaly returning to Athens on the 7th of June. You can join any of the 1 week cruises which are one-way, starting at one island and finishing at another one. Transfers between the specific islands and Athens are very easy, as there are numerous ferries every day connecting them with Piraeus (the port of Athens). Our Greek Island cruises vary from year to year, so below you can check our cruising plan for 2015 (click on the cruising area to read more about the islands groups). You can also check for availability by clicking on Velos Availability or Alexandros Availability at the left menu on this page. 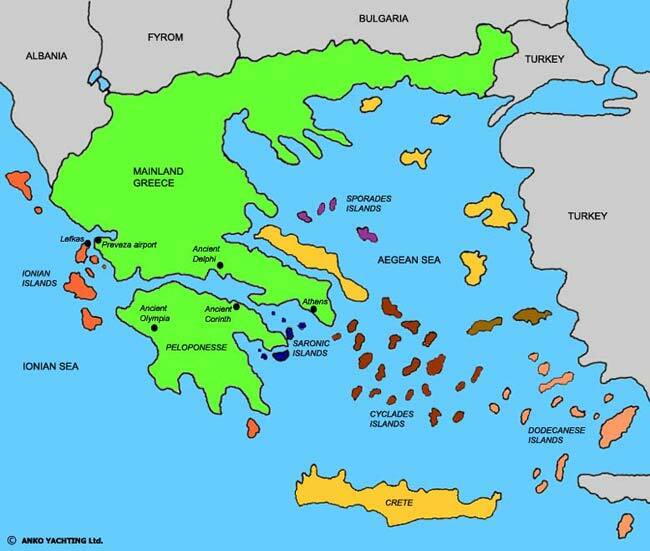 The Cyclades in the Aegean (the islands with the well-known whitewashed houses) and the Dodecanese (Rhodes, Kos, etc.) are two very popular areas, but because of their distance from the mainland it's not possible to visit them in a one week cruise. For 2014 we planned a long cruise starting in Athens on the 20th of April, sailing through the Cyclades, the Dodecanese, back through the Cyclades, finaly returning to Athens on the 1st of June. You can join any of the 1 week cruises which are one-way, starting at one island and finishing at another one. Transfers between the specific islands and Athens are very easy, as there are numerous ferries every day connecting them with Piraeus (the port of Athens). Our Greek Island cruises vary from year to year, so below you can check our cruising plan for 2014 (click on the cruising area to read more about the islands and suggested routes). You can also check for availability on Velos and Alexandros by using the menu on the left.